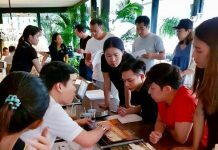 Marriott International has announced the signing of seven management agreements with TCC Hotels Group which will see the US hospitality company operating seven TCC hotels across Thailand. 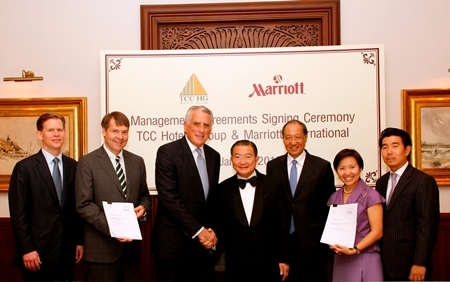 These agreements make the TCC Hotels Group the largest owner of Marriott International hotels in Asia Pacific. The seven hotels are: The Imperial Queen’s Park Hotel, Bangkok to be rebranded as Bangkok Marriott Hotel Queen’s Park; Imperial Adamas Phuket Beach Resort to be rebranded as Phuket Marriott Resort & Spa, Nai Yang Beach; Hua Hin Marriott Resort & Spa; Pattaya Marriott Resort & Spa, Jomtien Beach; JW Marriott Pattaya Resort & Spa; Bangkok Marriott Hotel and Executive Apartments, Surawong and The Ritz-Carlton, Bangkok. Charoen Sirivadhanabhakdi, Chairman of TCC Group (4th right) and Simon Cooper, President & Managing Director Asia-Pacific, Marriott International (3rd left) shake hands at the official signing ceremony between TCC Hotels Group and Marriott International. Also in the photo (left to right) are Shawn Hill, Regional Vice President – Hotel Development Asia-Pacific, Marriott International; Paul Foskey, Executive Vice President – International Hotel Development Asia-Pacific, Marriott International; Charles Mak, Managing Director & President – International Wealth Management, Morgan Stanley; Wallapa Traisorat and Soammaphat Traisorat – President and CEO, TCC Hotels Group. 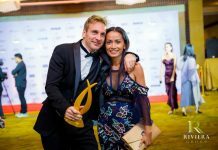 Speaking at the signing ceremony in Bangkok, Simon Cooper, Marriott International’s president and managing director Asia Pacific, said: “We are delighted to announce this landmark deal for Thailand. TCC Hotels Group is very well established as a hotel owner and operator around the world and these seven hotels will add to our already strong portfolio of hotels in the country.